Do you ever wonder what it is like to be out on R/V Stenella? 7am – 8am: Rise and shine and jump into your bathing suit. You never know when the dolphins might show up, so you have to be ready to get in the water at a moments notice. The dolphins are sometimes early risers; it is not uncommon to have encounters by 7am, so it is best to be up and ready. Grab some breakfast in the salon: cereals, yogurts, bagels, breads and fresh fruit on most days, sometimes hot breakfast (eggs, bacon) on others. 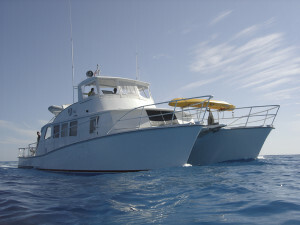 9am – 12pm: We usually pull up the anchor around 9am to start searching the area for dolphins. You will be put to work, as you do your first dolphin watch of the day. After your 1 hour shift, you have down time to read, listen to music, talk or just enjoy the view. 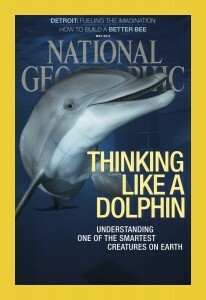 We have plenty of scientific articles, information on individual dolphins and other interesting educational materials to read. We encourage you to learn more about the research you are helping with, as well as the individual dolphins you may meet along the way. 12pm – 1pm: Lunch is set out. Lunch is at the discretion of the cook, though there is often sandwiches, various salads (regular, pasta, tuna, etc), sides (chips, crackers), sometimes soups, hot sandwiches or leftovers (always a boat favorite). Sandwich fixings are always available. But beware, this is a favorite time for the dolphins to show up, so just as you are about to bite into your sandwich, here they come and next thing you know it is 2pm! 1pm – 8pm: The boat is still underway, however we may take some time to drift or anchor depending on the day. During the afternoon hours you will work your second dolphin watch. Other hours are down time, this is often a popular time to take a nap but remember, the dolphins can come at anytime, so don't sleep too deeply! Snacks are usually put out to nibble on throughout the day. 8pm: Watches are over and dinner is served. The cook serves a wonderful meal, which can include beef, chicken, ham or turkey, with sides of a variety of fresh vegetables and/or salads, rice or pasta. We love to barbeque, and have a full size grill on board. Enjoy dinner on the aft deck on our picnic table large enough to seat everyone. The sunsets are beautiful, and sometimes we see gorgeous lightening shows from large storm clouds in the area. 9pm – 11pm: Dishes are done and now it is time to watch dolphin video. Every night we review the video that was taken during encounters that day. Sit in the salon and watch the video, learn identification marks of individuals and learn about their behavior as well. Feel free to ask questions, about what you see, or saw while you were in the water. Video can be anywhere from 10 minutes to an hour or more, depending on the encounters of the day. After video you have free time. People often enjoy the aft deck and stargazing. Away from all the city lights, you will be amazed at the beauty of the stars and the night sky. You are free to stay up as late as you want, but most people are in bed by 11pm, because they days are long, they start early, and the dolphins can tire you out in a day! Sleep tight, and wake up refreshed for another great day on board R/V Stenella! These are wild dolphins, and you never know when they will show up (anytime between 7am and 8pm), or how long they will want to stay (encounters can be anywhere from 5 minutes to 3 hours), so you must always be prepared and ready to go anytime during the day. There can be days with no encounters, and others with up to 4. Consequently there is a lot of down time, so be sure to bring things to keep you occupied it is a great time to catch up on reading. We hope this gives you a better idea about what happens on a day-to-day basis during a trip and answers some of the questions you have. If you have more questions, check out our trip FAQs page.